Redustat Boost contains Orlistat 60mg and L-Carnitine 200mg both ingredients will help you lose twice the weight of what you would achieve only with physical exercise and balanced food. No rebound effects and so sure that it can be taken by men and women from 18 years old. How You Should Take Redustat Boost? Almost all foods contain fat, so you should take one capsule of Redustat 60 mg with each meal or maximum one hour later. It is important not to take more than 3 capsules per day. You should supplement Redustat Boost with a multivitamin once a day. 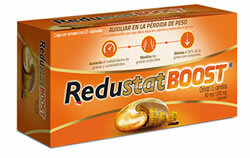 Redustat Boost prevents 30% of the fat contained in the food you consume from being absorbed into your body. It works by preventing the fat from assimilating in your intestine and adhering to your body, eliminating it naturally. In this way, the reserves of fat that your body has, will be used to produce the energy you need, accelerating the loss of weight and height. Orlistat removes 30% of the fat contained in the food we eat. It acts in the intestine decreasing the absorption of fats from the food we consume and eliminating fat in the stool. L-carnitine is a natural ingredient that helps in the management of weight control by reducing body fat and converting it into energy. Can Diabetic Patients Take Redustat Boost? Diabetic patients can take Redustat with orlistat which helps control blood glucose in patients with type 2 diabetes, obesity and overweight and for patients treated with hypoglycaemic medications (diabetes medications) or insulin. How Can I Get Better Results With Redustat Boost? Complement your lifestyle with a low fat diet and regular physical activity such as walking 30 minutes every day to accelerate energy consumption and to lose weight quickly. Redustat Boost Have Any Interaction With Other Medications? Redustat DOES NOT interact with alcohol or medications such as digoxin, nifedipine, oral contraceptives, phenytoin, pravastatin, statins, warfarin or metformin. Redustat Boost Has Any Side Effects? Clinically no side effects have been proven. Redustat effects limited to the gastrointestinal tract can occur when there is excessive intake of fat, causing it to be evacuated in a liquid way or producing an increase in defecation. That will depend on each person, you can lower a percentage equal to or greater than 10% of your body weight at the end of the treatment that goes from 3 to 6 months. But the results may vary depending on the functioning of each person. Who Can Take Redustat Boost? For the treatment of obesity Redustat can be taken by men and women, from 18 years of age, during weight loss and in maintenance treatment along with a diet low in fat and calories. Can Redustat Boost Be Taken by Women during Pregnancy and Lactation? The safety of Redustat 60 mg during pregnancy has not been established and it is not known if it is excreted in breast milk, so its use is not recommended during pregnancy or lactation. Why Is Recommended To Take a Multivitamin While Taking Redustat Boost? At the time that the absorption of fats is reduced, the levels of fat-soluble vitamins (that is, they use fat to be absorbed) could decrease. This is the case of vitamin A, DE and K, so a conventional multivitamin helps those levels remain in normal ranges.